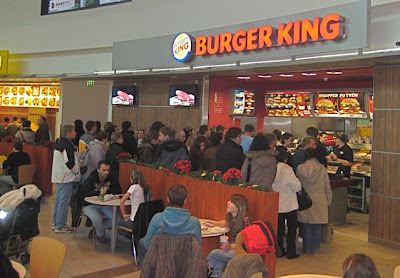 The first thing I noticed at the first Burger King in the Czech Republic was the herd of people waiting to place an order. There were three times more people waiting there than at the neighboring McDonald's or the KFC at the Metropole Zličín mall. I was surprised how small the service counter was. Luckily, I chose the line with the fastest cashier and got to the register in about five minutes. Others waited quite a bit longer, especially if they asked for custom-made burgers. 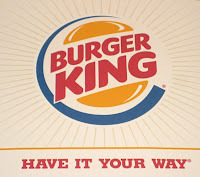 There were pre-made regular Whoppers and Big Kings to expedite orders. You can get a bigger drink and fries for an extra 10 CZK. Bacon and cheese were available for an extra 10 CZK. On a paper menu they gave us, I also saw they had items like wings, onion rings, and salads. But we had already placed our order. While I was in the mosh pit at the registers, V was in search of a table, all of which were taken. This was no full restaurant. Just part of the food court. Metropole Zličín mall was a madhouse, especially because it was holiday season. She saw some people finishing up and waited by the table. Then, she had a little confrontation with a man who tried to take it. "I was waiting here first," she said. "Yeah, but you have no food. I'm ready to eat." "It's coming," she replied, standing her ground. "That's not right," he grumbled and moved off. I arrived at the table with our order: a Double Whopper, a Grilled Chicken Wrap, two orders of fries, a Coke, a Diet Coke, and three ketchups (5 CZK each). The total was 249 CZK. 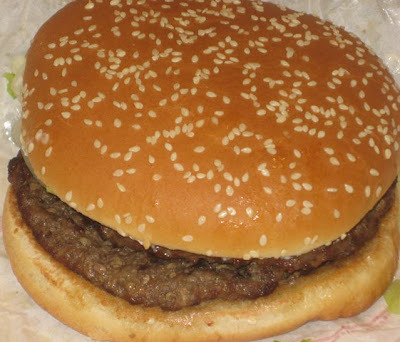 The Double Whopper was much the same as the many others I've eaten. It had that great flame-broiled flavor that puts it a step above McDonald's in my book. I love the smokey taste. The build-quality was not the best I've seen. 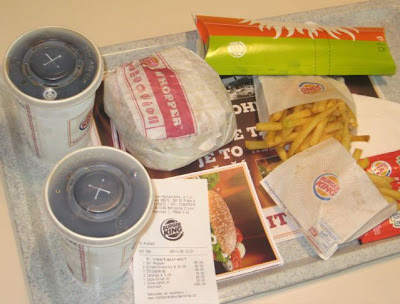 The best I've ever had was a beautifully constructed, well-balanced, fresh Whopper at a BK just outside Munich. It was the BMW of Whoppers. The one at Metropole Zličín was the Skoda of Whoppers, which is no bad thing these days. But not top of the line. 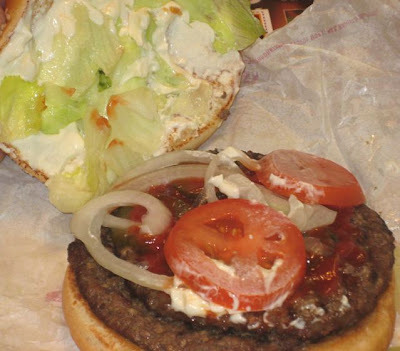 The biggest fault was too much mayo, followed by haphazard onion, lettuce, and beef patty placement. I like BK fries better than McDonald's fries. They are slightly thicker cut and feel more substantial. 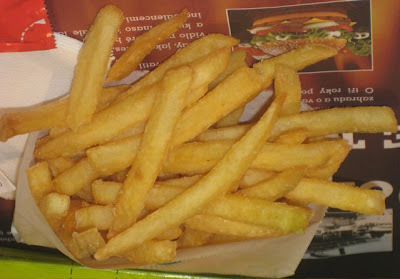 There were fewer little runt fries at the bottom of the bag. 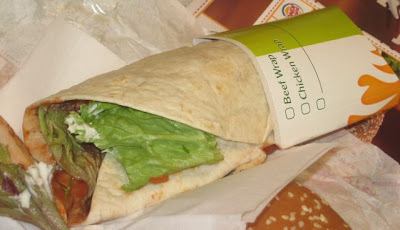 I had a couple of bites of V's grilled chicken wrap. She liked that the meat was not breaded and also had the smokey flavor from the grill. It had a tomato salsa inside, along with wilted lettuce, and mayo. I didn't think the mayo and salsa went well together. Also, the flour tortilla didn't have much structural integrity. It was floppy and hard to hold without the chicken falling out. Best to stick with the burgers. More outlets will probably open in the center. 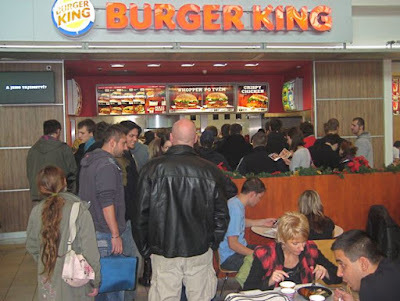 But I don't I'll be going to a Czech Burger King again any time soon. For a while at least, they'll be like the one at this mall: crowded, hectic, and generally unpleasant. I did well with the first line. But I'd have trouble doing it at the others. In Eastern Europe (former socialist world) they always charge you for ketchup. The sauce thing in restaurants can cost more to borrow for your meal than they would cost in a shop. Same thing in Slovakia, Hungary, Poland etc. People just don't generally have ketchup here. It's messed up. Great post! 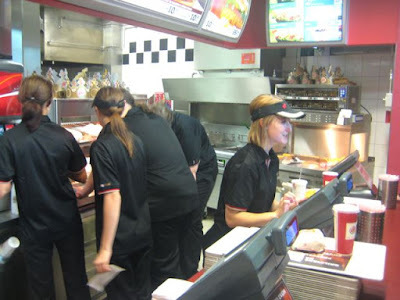 It was interesting to read what you thought about an American fast food restaurant in the Czech Republic! :D I will agree that BK tastes better than McD's, but personally I try to boycott all of those kinds of places in every country! LOL. And, while we in America can have all the sauces we want for 'free', it doesn't bother me that I would be charged for it somewhere else. Here in America we are wasteful. People take bags full of the ketchups, then throw them out when they don't use them! It is sad really. Then, there are the people who 'steal' the ketchups by the bagful to use at home... I wish we charged for ketchups here!